In December 1967, in a dense jungle in South Vietnam, a Catholic chaplain was accompanying U.S. Army forces on a search and destroy operation when they came under heavy fire from an unseen enemy battalion near Bien Hoa. Stunned by an explosion of rockets and machine-gun fire, the Americans hit the ground, all but paralyzed. All except the chaplain, Charles Liteky, who rose up after spotting two wounded men lying less than 50 feet from an enemy machine-gun position. Undeterred, Liteky rushed to them, shielding them with his body and dragging both to safety. The Army said Liteky's courage was the reason U.S. troops rallied and returned fire, allowing Liteky to continue to move through enemy ﬁre, administering last rites and evacuating the wounded. When the fighting ended, Liteky had brought more than 20 wounded men to safety, despite being wounded himself in the neck and foot. A year later, in November 1968, after the war had engulfed his presidency, Lyndon Johnson awarded Liteky the U.S. military's highest tribute, the Medal of Honor, at a White House ceremony attended by Gen. William Westmoreland, who had commanded U.S. forces in Vietnam. As he draped the medal around Liteky's neck, Johnson said, "I'd rather have one of these babies than be president." No one who knew of his battlefield exploits was surprised by the honor. What shocked many was that 18 years later Liteky renounced the medal, leaving it at the Vietnam Veterans Memorial in protest of the Reagan administration's covert war against the Nicaraguan government. 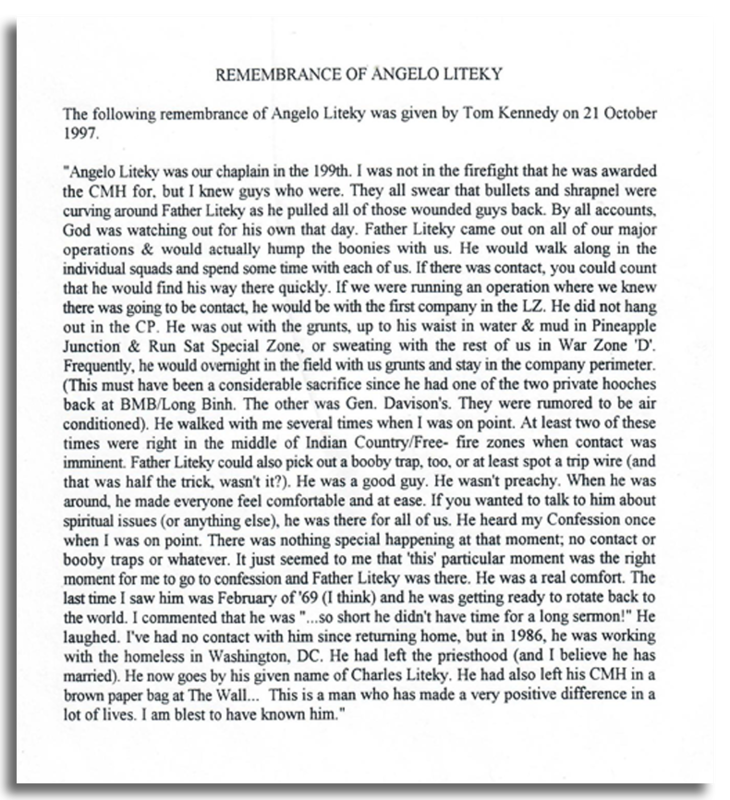 Click here to read the full obituary at National Catholic Reporter. In 1983, Charlie married Judy Balch, a former nun, college math teacher and peace activist in San Francisco who was working in the sanctuary movement with refugees from war-torn Central America. After she opened his eyes about what the U.S. was doing there, Liteky went on a fact-finding mission to El Salvador in the early 1980s along with ten Vietnam veterans. It was a trip that forced him to wrestle with the demons he was carrying. SAN FRANCISCO (AP) — Charlie Liteky, a former Army chaplain who received a Medal of Honor for carrying more than 20 wounded soldiers to safety in Vietnam but later renounced the award as a bold protest against U.S. foreign policy, died Friday. He was 85. A resident of San Francisco, Mr. Liteky had been a relentless champion for peace for decades, winning respect not only in antiwar circles during the Cold War and ensuing American conflicts in the Middle East but also from onetime colleagues and admirers in the military. At a protest outside a training base in Fort Benning, Ga., where Mr. Liteky twice was sent to prison for his pacifist acts, Army paratroopers and Navy commandos were said to come outside the gates on occasion to meet Mr. Liteky and thank him for his service. “He was a person who took his beliefs and his values very seriously,” said longtime friend David Hartsough of San Francisco. “If you love your neighbor and your neighbor is getting beat up, he did something about it. He believed that people in Central America and people in Vietnam and people all over the world were his friends and family." 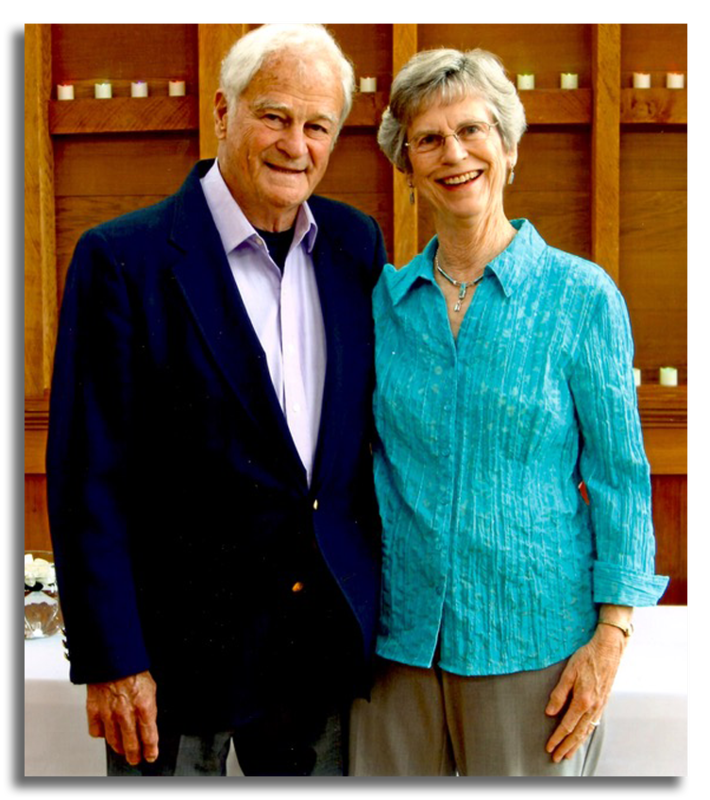 Click here to read the full obituary in the San Francisco Chronicle. Charlie Liteky, an Army chaplain in Vietnam who was awarded the Medal of Honor for his efforts to save the lives of others and then gave it back decades later to protest Reagan administration policies in Central America, died Jan. 20 in San Francisco. He was 85. David Hartsough, a friend and fellow peace activist, said Mr. Liteky was in hospice at a Veterans Affairs hospital in San Francisco. He had suffered a stroke in December. Established by Congress during the Civil War, the Medal of Honor is the nation’s highest award for valor in combat. According to the Congressional Medal of Honor Society, 3,498 individuals have received the award; Mr. Liteky, according to operations director Victoria Kueck, is likely the only person to return the award. Yet about two decades after President Lyndon B. Johnson placed the Medal of Honor around Mr. Liteky’s neck—telling him, according to one account, “I’d rather have one of these babies than be president”—Mr. Liteky transformed himself from a reticent Army veteran into an outspoken peace activist. Click here to read the full obituary from The Washington Post. His death was confirmed by a friend, Richard Olive, who said Mr. Liteky had suffered a stroke several weeks ago. Mr. Liteky, who was a Roman Catholic priest when he was given the award, is believed to be the only one of nearly 3,500 recipients of the medal since the Civil War to have returned it in a demonstration of political dissent, Victoria Kueck, the operations director of the Congressional Medal of Honor Society, said on Monday. He acted out of opposition to the Reagan administration’s support for Central American dictators accused of brutally suppressing leftist guerrillas. 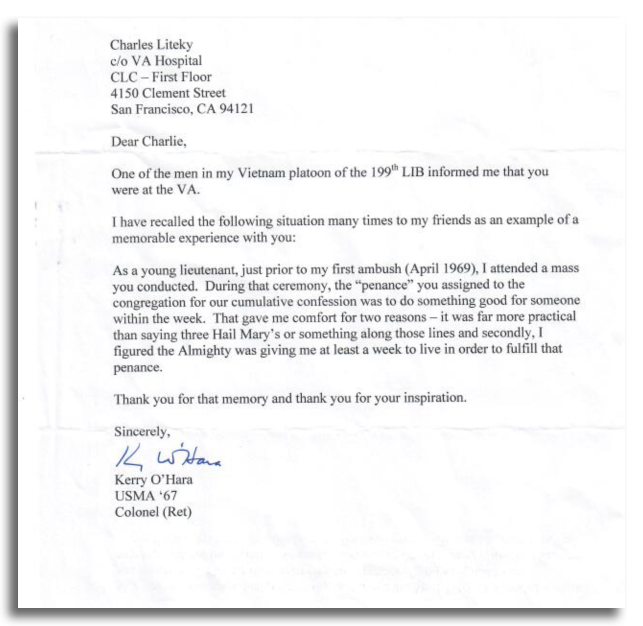 In 1986, Mr. Liteky (pronounced LIT-key) left the medal in an envelope addressed to President Ronald Reagan at the Vietnam Veterans Memorial in Washington. He also renounced the lifetime tax-free monthly pension—then about $600, now about $1,300—that went with it. Mr. Liteky, who later served two federal prison terms for civil disobedience as a war protester, said he was motivated in his political dissent by the commitment that had inspired his bravery on the battlefield in Vietnam. Click here to read the full obituary in The New York Times. 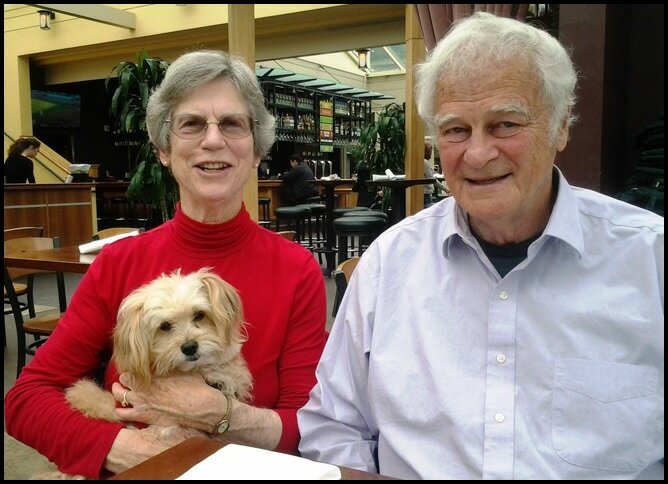 Charlie and Judy with their dog, Scarlett. Judy Liteky died in August of 2016. It's 1948, third down and long at Robert E. Lee High School on the Westside. Charlie Liteky, a darkly handsome, 6-foot-1, 160-pound senior, trots on the field. The other team knows what he's going to do: Throw the ball. Because that's the only thing he does. And he's going to do it again. It's 1967, an ambush in a Vietnam rice paddy, where machine gun fire and rockets sing their deadly song. Army chaplain Charlie Liteky gives last rites to the dead and dying, often walking upright amid the bullets. And more than 20 times, he carries the wounded from the battlefield to safety. There is so much blood, he'll smell it until the day he dies. Click here to read the full obituary in The Florida Times-Union. © Copyright 2017 CharlieLiteky.org -- All rights reserved.